I made this, one experimental morning, and fell in love instantly. Like a fruity, floral breath of fresh air, it scintillated my senses and seduced my soul. A spiked smoothie to leave me invigorated and glowing with health and happiness... in the short time since the idea was born, I've made this many times over, and it shall, if all goes according to plan, accompany me as I say goodbye to 2012, and ring in 2013.
pimm's lemon jasmine banana cocktail-smoothie. So at this moment, your mind is either running through all sorts of gleeful alcoholic smoothie possibilities or you're thinking, "This lady be crazy." And before you start to worry... no, I'm not becoming an alcoholic. In fact, one of the reasons this breakfast cocktail came about was because I still had nearly a full bottle of the Pimm's No. 1 that I purchased for last year's New Year's celebrations. Yeah, I wasn't kidding in that post when I said I was bad at drinking. A little prep in advance is required for this cocktail-smoothie recipe, but it's all tremendously easy. The banana needs to be peeled, the flesh broken into chunks and frozen. The jasmine green tea, too, is brewed with warm (but not boiling hot) water, then left to steep and cool. This is all preferably done overnight; however, I've also made this with only a few hours' notice, with the encouragement of friends, and the help of a few ice cubes. It was so well-received that I couldn't make enough: it was love at first taste for them, too. Now, without further ado, here's the recipe. Be warned: it is dangerously easy to drink. a healthy cocktail with lemon juice, jasmine tea, frozen banana, and pimm's no.1. 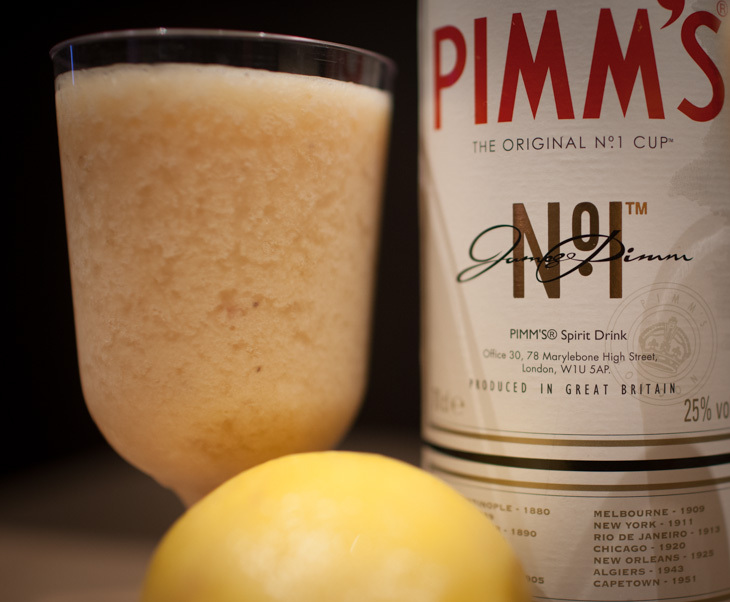 Blend jasmine green tea, frozen banana chunks, lemon juice and Pimm's No.1 (or other liqueur of your choice) together until smooth. 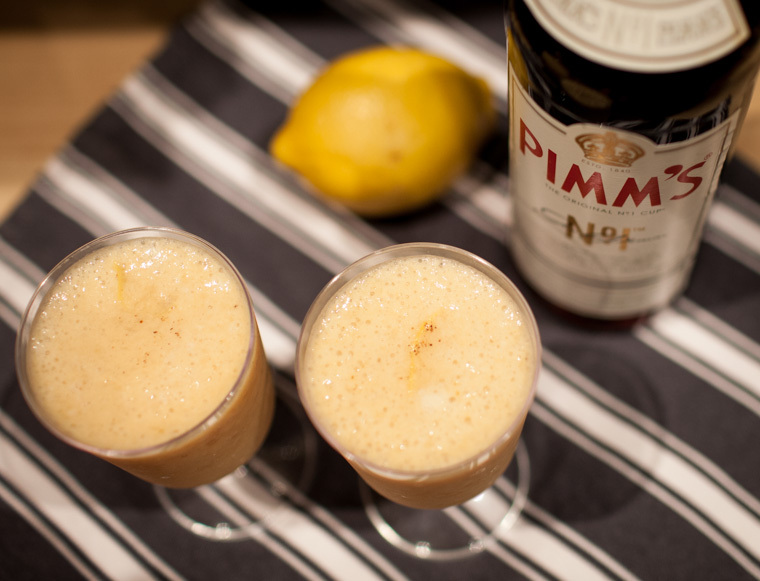 Pour into glasses, and garnish with a little lemon zest or nutmeg, if you like. Serve immediately while it's deliciously cold. I would never in a million years have thought of using Pimms like this! And Pimms is only about 25% abv so this is only faintly alcoholic. Practically health food. What a lovely drink to ring in the new year! Accidental/experimental recipes like these are the BEST, Leaf! How awesome!! You are my go-to person for drinks recipes, among many other things. Thanks for another great one to add. Happy New Year to you, look forward to catching up with you again soon! I bought a bottle of PIMM'S when I went to NZ ages ago and I STILL haven't opened it Must and try this! Ah! I love smoothies, cocktails and tea, I need this tea smoothie cocktail. Can't wait to try it. Hmmm, where to find Pimm's? Maybe it would be available across the border in Canada? Cause this sounds incredible. Bring on the healthy breakfast boozy smoothie! Crazy? No way. I was thinking you were especially inspired. Woah.. I would never have thought of combining jasmine green tea with bananas! Yum!